First of all, we would like to explain what is Noh? 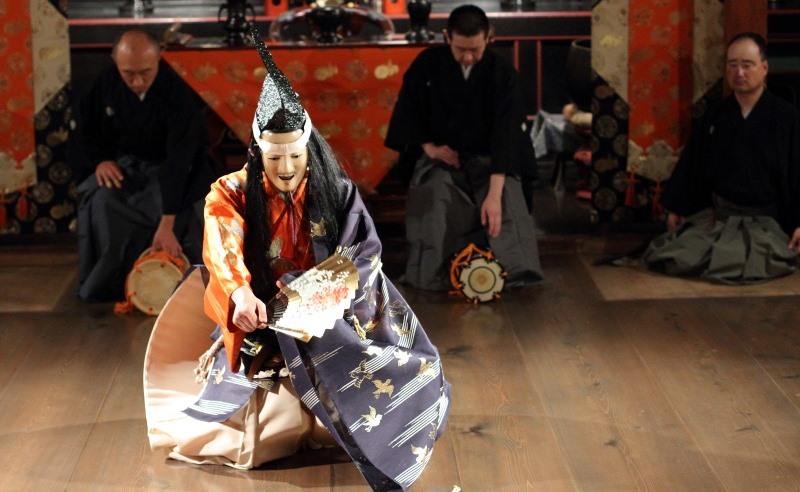 Noh is one of Japan’s traditional performance arts, with a history stretching back to the Muromachi Era. It involves music, dance, singing and storytelling. Although the stories appear simplistic, they are actually very deep, representing timeless themes suitable for any era. Faith in the gods. The transience of war. Young girl’s feelings of love. The love of a parent for a child. Getting rid of ghosts. The story progresses through vocal music known as ‘utai’, and accompaniment from musicians called ‘hayashi’ plays alongside ritual, dance-like movement. To put it simply, it is like a Japanese musical. The most unique thing about noh, is the noh-mask. It is a form of masquerade. 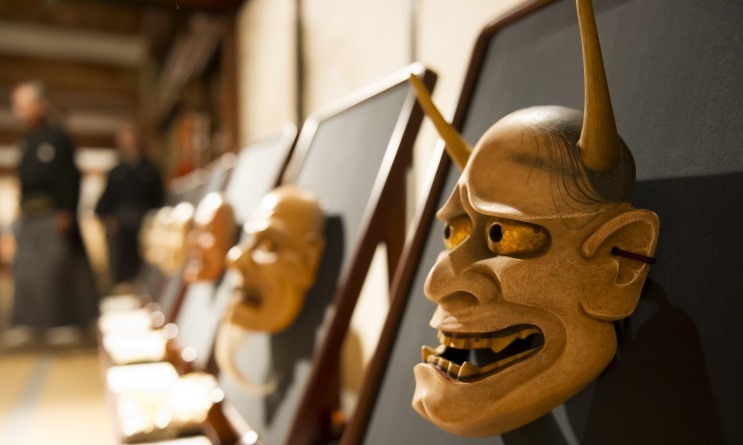 Noh-masks are made slightly smaller than a person’s face. It is said that there are over 250 kinds, but they can be divided into 6 main groups. In the unhurried acting of noh there can be many nuances included in just one movement, this minimizes the expressing of feelings, and the masks that appear expressionless, actually hide expressions in a number of ways. The costumes used in noh are called ‘nohshozoku’. They really represent the beauty of noh, but the original costumes were actually very simple. Towards the end of the Muromachi Era, the costumes began to become more resplendent, and by the Edo Era when noh became the ceremonial music of the samurai, it was stylish and complete. In 2008, UNESCO awarded noh intangible cultural heritage status. See firsthand the skills and techniques involved in the production process that brings these seemingly expressionless masks to life by way of lighting and sharp angles. Also, listen to an explanation of the types of mask by the maker and observe a real demonstration. The costumes used in a Noh play, are splendid and very elaborate, using a lot of silver and gold thread. On the other hand, plain cloth, yet with distinctive hues, is used in noh farces and comedies. All kinds of noh costume can be found here. See firsthand the way in which the clothes are produced and see the finished articles accompanied by explanation from the master of the workshop. 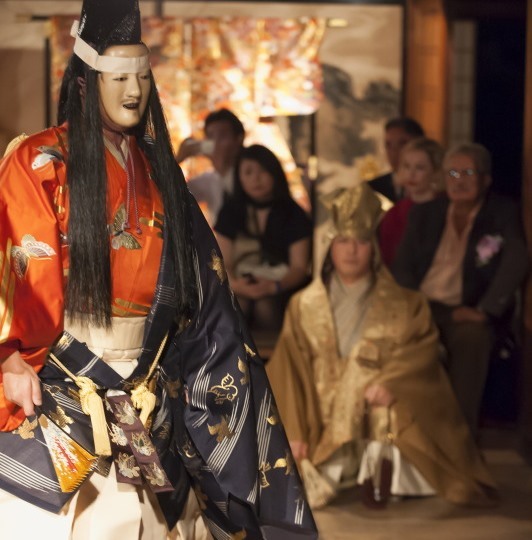 Have your interest in noh peaked thanks to an easy to follow explanation from a Noh actor. Visitors can also try out ‘utai’, go on stage, watch how costumes are put on and witness a real performance. Price Depends on Noh theater, please ask us. 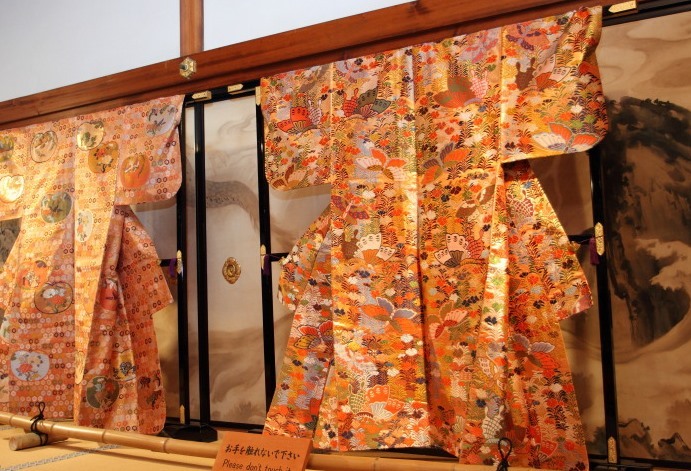 Through this experience you can actually try on Imperial court clothes such as a ceremonial court lady’s robes, first established in the Heian Era, some 1000 years ago. You’ll be able to feel affinity with historical figures who appear in classical Japanese literature. Maiko and geisha who are part of the honored tradition of Kyoto, will make tea especially for the visitors, in a traditional temple. You will also be able to take photos with them. 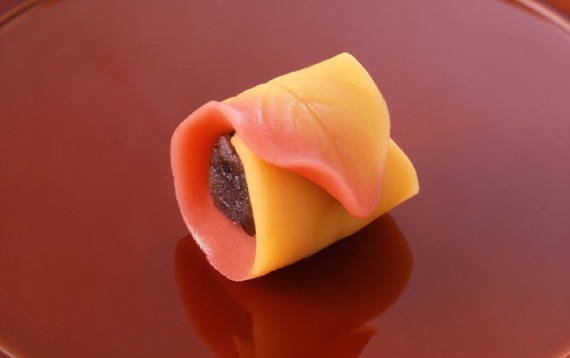 Watch Japanese sweets being made by an expert from a long-established Kyoto confectioner, and then try it for yourself. 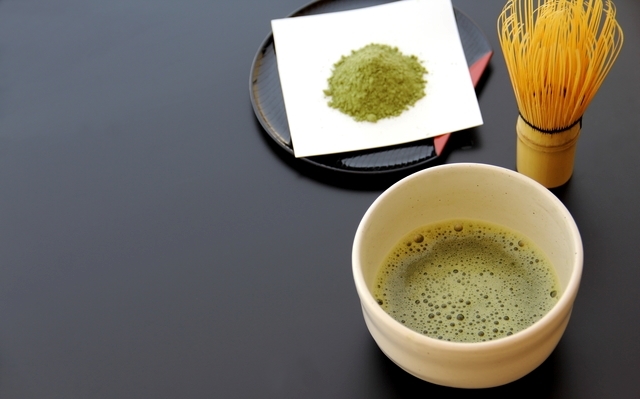 You will be able to enjoy the sweets you made with some powdered green tea and also visit the Kyoto Confectionary Museum. Yoroi includes the making of armor, helmets and traditional Kyoto braid and metal fittings. You will thoroughly enjoy this traditional Kyoto technique is used to make armor that has both functional beauty and aesthetic beauty. Learn the history and meaning of the different parts of the armor from the armor maker and then try it on for yourself. Brocade is a handwoven cloth made on a loom called a ‘takabata’, which was first introduced to Japan from China more than 1200 years ago. It is a figured fabric made using multicolored, elaborate and luxurious silk. This workshop first made outfits for the Emperor, and also handled brocade for the Crown Prince’s Palace and Kyoto State Guest House. You will be shown around the production facilities and get to see some finished articles. At a 200 year old shop selling Buddhist articles you will learn about engraving, lacquering, gold leaf stamping, and the production of Buddhist altars and their fittings. You can tour the modern day workshop and try out gold leaf stamping for yourself.